Infantry can be trained in the barracks. The higher its level the faster the troops are trained. 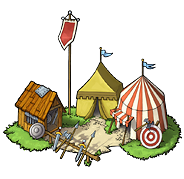 If you want to build more advanced troops than the first troops, you'll need to research them using the academy.